News and views McFen Plant Hire. Insight into the world of plant hire. 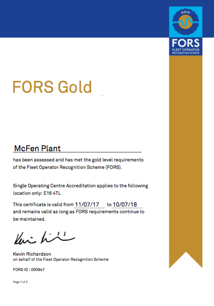 McFen Plant is proud to be the first plant hire company to achieve the prestigious FORS Gold accreditation. We have maintained our FORS Gold accreditation for over five years now as well as having three FORS practitioners working at our East London Depot.